Daniel has to visit the doctor, and he's a little nervous. But with a little help from Mom and Dr. Anna, suddenly the trip isn't so scary anymore! 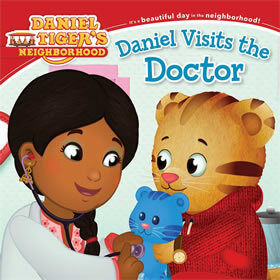 Daniel Visits the Doctor begins with Daniel playing doctor. Mom Tiger reminds him that he is scheduled for a check-up with Doctor Anna. 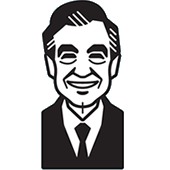 Daniel takes readers through the check-up step by step. The final page of this offers an illustrated checklist of things to look for at the doctor's office. This book follows the same storyline as Episode 102b. 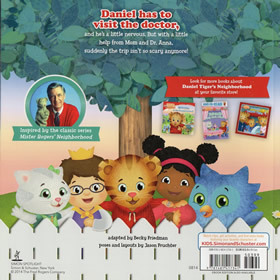 This book is one of the titles included in the Daniel's Grr-ific Stories set and Daniel Tiger's 5 Minutes Stories.